This stuff is really gross. I can't believe I paid 2 bucks for it just now. Granted, I may have nuked it about 30 seconds longer than the directions I didn't bother to read advised, but I still think that's no reason for it to taste like a cat ate burnt rubber bands and then puked them into a bowl. God, even the smell is starting to interfere with my workplace productivity (which I was trying to improve by eating this crap in the first place!!) As much as my disdain for high fructose corn syrup can often be blamed for the cause of convenient foods being less edible than those your grandmother slaved over for hours... 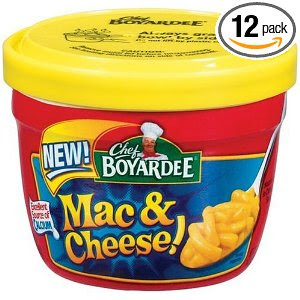 I'd have to say I'm letting the diabetes-inducing goop that is the basis of most American foods off the hook this time: Thanks mom, for never letting us eat Chef Boyardee when we were kids. Gross.